Hi authors! I’m not dressing up this post with pictures and frills. This is business! If you’ve been trying to grow your Twitter following, this post is for you. You can offer as many books as you’d like, keeping in mind you have to pay retail price + shipping + applicable tax. You can set up the giveaway in two ways. 1) first come, first serve. Don’t pick that one. Or 2) offering your book to a lucky number (entrant). You can require your entrants follow you on Twitter. If you choose option 2, click “lucky number” and the button to connect to your Twitter account, select the winning entrant from 2-50,000, enter the number of books you’re giving away. The giveaway will run for one week. You cannot change the dates. MATH: I know what you’re thinking – if I give away 5 books, 1 to every 20th entrant, I’ll get at least 100 new Twitter followers. No, no, no, think bigger. That’s what I did the first time and the 5 books were gone in less than a half hour. Yes, I got just shy of 200 Twitter followers, but the giveaway was over before I even told my Facebook people to enter. Set it up for a BIGGER number. If you give a book away to every 1000th follower, you would get 5000 Twitter followers! FIVE THOUSAND. It’s taken me two years to get to eight thousand. Maybe even go bigger if you’ve got the guts! You need to fill out three short blurbs, one to announce the giveaway, one for the people who didn’t win, and one to congratulate the winners. The contest is instantaneous. The entrant learns if they’ve won or not at that moment, so they’re not going to put off buying your book because they want to wait and see if they’ve won. I filled out the forms like so: Enter to win one of five paperbacks of XYZ. – Sorry, you didn’t win this time, but stay tuned for future giveaways. – Congratulations, you’re the winner! Enjoy XYZ and please check out all my books. WORK: The cool thing is that Amazon does all the work. They contact the winners. They ship the books. You do nothing! It costs more than hosting a giveaway yourself, but when’s the last time you got 5000 Twitter followers from your giveaway? MONEY: My paperback sells for $9.99, so my total cost for 5 books with shipping and my Tennessee tax was about $82. I got $13 back in royalties from CreateSpace AND I got credit for the sales in my Amazon rankings. THE PIS DE RESISTANCE: If you don’t give away all your books in the allotted week, Amazon will return your unused money. #2 Behind William Freakin’ Shakespeare! 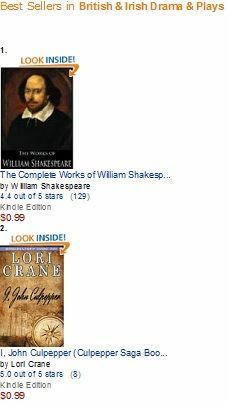 My book I, JOHN CULPEPPER is sitting at #2 behind William Shakespeare…YES, THE William Shakespeare. If for some crazy reason I pass him, I will consider it my best. day. ever. 🙂 Pick it up HERE for $0.99 and make it happen!